The Plus is compatible with the Slide Tract, powered and manual hinge systems so if you have a doorway close to the bottom of your stairs the Simplicity Plus offers a range of solutions to prevent the track from causing an obstruction. The Plus comes with a 2 year warranty on manufacturer’s parts and a LIFETIME warranty on the gearbox and motor. The Simplicity Plus offers the choice of manual or powered folding footplate and swivel options. The Simplicity Plus is compatible with the Slide Track, powered and manual hinge systems so if you have a doorway close to the bottom of your stairs the Simplicity Plus offers you a range of solutions to prevent the track from causing an obstruction. 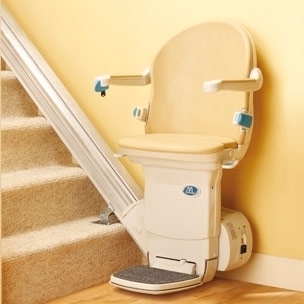 All stairlifts have safety sensors on the power pack and footplate: these are designed to stop the lift if it meets any obstruction. Once stopped it can only be moved in the opposite direction of the obstruction. We also supply our stairlifts with an easily accessible key switch that allows you to disable the lift and prevent unauthorised use so you do not need to worry about unsupervised children playing with your stairlift. The seat for the Simplicity+ is available in two variations to suit individual needs. The seat is supplied with wipe clean, flame retardant upholstery in a choice of six colors. You can even replace upholstery later should you wish to change your color scheme. The Perch seat proved the ideal option for users with limited hip and knee flexibility. A Perch seat means that the user is almost in a standing position when they are using the lift. There is a shortened seat and retractable seat belt which provide a stable support area for users to 'perch' on.